The Alpha Beta Daily Face Peel, is a two-step, at-home peel in ready-to-use pads that deliver both immediate and long-term benefits. The patent-pending system provides a precise blend of alpha and beta hydroxy acids to improve skin tone, texture, and clarity, plus moisturizers, green tea extract, and antioxidant vitamins A, C, and E to leave skin soothed, balanced, protected. Because every acid has its own benefits, using 5 instead of 1 makes this peel more beneficial than those with just 1 acid. Diminishes the appearance of fine lines and wrinkles by stimulating collagen production and improving skin density and firmness. Visibly reduces pore size and helps prevent breakouts by regulating oil production. Evens skin tone, minimizing areas of discoloration and enhances skin's radiance and clarity. 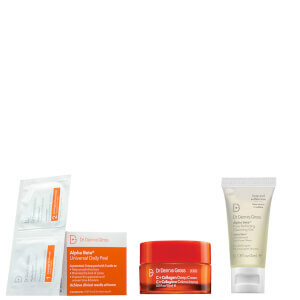 Effectively treats stubborn skin conditions, such as acne and rosacea. Results are cumulative with continued use. Step 1 - Apply to clean, dry skin. Swipe Step 1 pad over face, from forehead downward to neck in semi-circular strokes. Avoid contact with eyes and lips. Continue to apply evenly until pad feels dry. Wait 2 minutes. Follow with Step 2. Step 2 - The key to professional results. Swipe Step 2 pad over the face with the same technique as Step 1. Apply until pad feels dry. Do not rinse or use products containing alcohol. Allow skin to dry. Apply moisturizer. Packaged in two jars of 30 pads each. I really like this product but I do not like the fact that Skinstore will have a storewide discount but then this is not included in it. Not good guys. but using a 2 part system can be time consuming. regardless, makes skin look and feel great. These peel pads work great, they heal blemishes quickly and leave a nice glow to my skin. I am dry and cannot use these daily. I use them once or twice a week. If I look dull these brighten my skin right up. This product has improved my skin by vast amounts; in clarity, texture and tone, it clears out my blackheads and smooths out whiteheads over time. This product has made probably the biggest difference in my skin overall, even over retinol. I use the regular or extra strength peels every 3 days for maintenance. I would use more often but it is a bit pricey, that's the only drawback!